This lesson describes the steps to pick a polygon on a time/depth slice in the Map View. 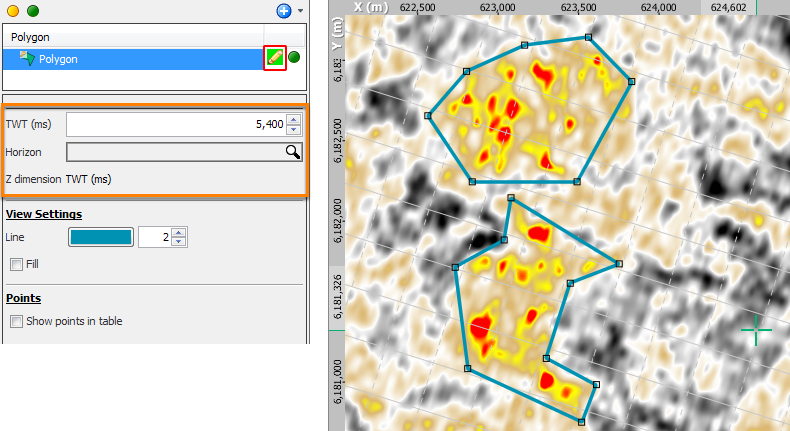 Insight supports the creation of multiple shapes in one polygon. After creating a new polygon and defining a shape, simply click on another location with picking enabled to begin picking another shape. This means that you do not have to create new polygons for every shape on a particular time/depth slice. Besides that, a polygon can now be associated with a horizon so that all polygon shapes and points will be along that horizon. In 3D view, the polygon will be drawn draped over the horizon. This also facilitates the creation of fault polygons intersecting with a particular horizon (see Using Fault Polygons). Polygons can also be created from contours in Map View (see Displaying Contours in Map View). On the map, make sure you are at the horizontal slice that you wish to create the polygon. Adjust the slice by changing the TWT (ms)/TVD (m) domain and values in the Navigation Bar in the Map View or in the Details Panel. Alternatively, associate the polygon with a particular horizon so that all polygon shapes and points will be along that horizon. To do that, select a horizon in the Details Panel of the polygon. In the Map View, click to define the perimeter of the polygon. Right click to finish picking. To add a new shape to the existing polygon product, click at a new location and begin picking another shape. Right-click an existing point while in picking mode to delete it. To move an existing point, click the point and click at a new location to place the point there. Right-click to end picking the points. To exit the picking mode, click the Pick polygon pencil icon at the polygon item row in the tree. Alternatively, double-click or press Esc to disable polygon picking in the Map View. 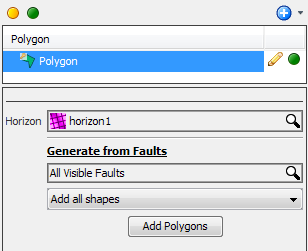 If you have chosen to associate the polygon with a horizon, fault polygons can be generated from fault intersections with the associated horizon. For more information on fault polygons, see Using Fault Polygons.